It seems a logical place to cut the budget. Why spend $100 for professional hair coloring when you can do it yourself for $8? Certainly in tough times, Americans could spend less than 60 billion dollars/year on beauty. If you've tried or are considering the "do it yourself" route to hair coloring, consider yourself in good company. The salon business is feeling the recession. Consumers are "stretching out" or, "stalling time" between visits. Business was down at 72% of hair salons surveyed by the National Cosmetology Association last summer. but it's easy enough to read between the lines (or through the spin). While the salon business is feeling the recession, hair dye sales to nonprofessionals have seen a steady rise at Sally Beauty Supply, an international distributor of beauty products. Although the Greeks and Romans colored their hair, modern hair coloring actually originated in the midst of the great depression. New York chemist, Larry Gelb found a European haircolor preparation called Clairol. The Miss Clairol Hair Color Bath was introduced in 1950 expediting the process and resulted in an increase in women going to salons for permanent haircoloring of more than 500%. Today, more than half of Americans color their hair and they aren't all women anymore. Men - graying baby boomers likely leading the pack - are coloring their hair in record numbers. Do you dare do it yourself? Maybe. Maybe not. It's more than simply self-promotion when hair colorists report an increase in frantic calls from do-it-yourself-ers who arrive for the first available appointment wearing a large hat. Repairing a bad hair dye is often more costly than the original professional coloring. 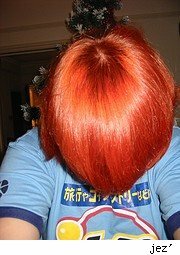 The more times you try to correct a problem yourself, that is the more chemicals you put into your hair, the more expensive it will be to have a colorist solve the problem. While hair coloring products are getting better all the time, salon products do tend to be of higher quality. You will want to leave your hair in the hands of a professional if it is already damaged. If you do try it yourself, use a semi-permanent hair color first, choose the color and read the instructions carefully and don't skip the strand test. If you haven't been coloring your hair, this probably isn't the time to start. Join consumers manifesting the, "lipstick effect." Inexpensive cosmetic purchases have been a popular consumer mood boost since the great depression. As for this baby boomer, no longer inclinced to pay $90 every six weeks to hide the gray, I'm considering the L'Oreal route with the guidance of an experienced friend. I'm also considering the purchase of a Hair Coloring Brush, now on sale at The Vermont Country Store which, with the assistance of 2 AA batteries (not included), is said to, "Easily distribute color with precision and ease." Reduced from $24.95 to $11.99.